Could This Be A Record! Wythall Community Association purchased their Duplex 420 back in 1993 and it’s still going strong 25 years later! 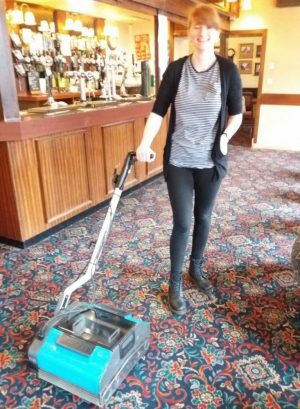 Duty Manager, Jess Denning said “we get the Duplex floor cleaner out for the bigger jobs when we know the floor has got a little too dirty for other machines as it will clean the carpets and bring the pile back to life”. In addition to the main social club, Wythall Community Association has another two function rooms which are available for hire by club members and also the public where they have been serving the community for 50 years so longevity is a bit of a theme here! Maintained under a Preventative Maintenance Agreement providing a regular service plan Jess hopes to have many more years use out of the machine. Jess, who has worked at the club for 11 years says the machine is light to use even on heavy stains and effective on any flooring and thinks that the machine’s consistent performance could be due to having it properly serviced and maintained on a regular basis by Duplex engineers.